If you like the idea of a pocketed coil mattress, but haven’t found the right one yet, then the Nest Bedding Alexander hybrid mattress might be just the thing you’re looking for. It’s a hybrid mattress designed for universal comfort, and does a good job providing a very luxurious, high quality, well designed sleep experience. Should I Buy the Nest Alexander Hybrid Mattress? 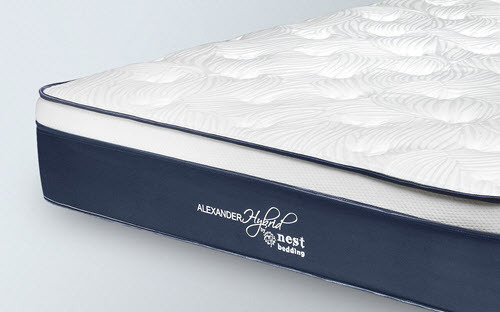 The Nest Bedding Alexander Hybrid is constructed from four layers which total 13” in combined height. The layers include the cover, 2 foam layers, and a pocketed coil layer. Let’s take a look at each. Top Layer – the top layer is a padded cover that measures 2” thick and is engineered to improve airflow for the foams while reducing the pressure points your body experiences on the mattress. Second Layer – the second layer of the Nest Bedding Alexander Hybrid is made from 2” of copper-infused gel memory foam. Copper may seem an odd choice, but its natural heat conducting properties do a great job of pulling heat away from your body while you sleep and keeping the surface of the bed cool. Third Layer – the third layer functions as support and is made from 2” of SmartFlow foam. It is a transitional support poly foam, and is also designed to improve cooling and support at the same time. Fourth Layer – the fourth layer of the Nest Bedding Alexander is the foundation. It is constructed from 7” pocketed coils. These coils work as the foundation of the mattress while providing deep compression support. They push back against the upper layers of foam to offer great bounce and a gentle feel. The Nest’s Alexander has a cover that is made from a blend of rayon and polyester (80/20). It also features a polyurethane foam pad to provide greater comfort and pressure relief properties. Moreover, the combination of these materials offers good cooling ability with a high degree of breathability. The cover itself looks very nice. It has a delightful mix of blue and white colors along the edges, as well as a floral pattern woven into the top layer. As a result, it has a solid mix of modern and traditional elements that most consumers will find appealing. The Alexander hybrid offers two different levels of firmness. The least firm option is described as medium, and the firmest option is described as luxury firm. On a sale of 1-10, with 1 being least firm and 10 being most firm, the medium comes in at a 6. The luxury firm option is rated at 7.5. This choice of different degrees of firmness is a nice touch, as many of the most popular hybrid mattresses we’ve looked at only come in one firmness. Both options will be good for the vast majority of sleepers, but those who prefer a softer mattress may not care as much for the luxury firm option. It’s important to note that the unique nature of the Nest Bedding Alexander Hybrid’s construction does a great job of taking advantage of the best aspects of memory foam and pocketed coils. Pulling off a combination of two different styles of mattress, particularly, these two, can be difficult. It’s all too easy to wind up with a mattress that has the worst combination of attributes from both styles. However, the Alexander does an admirable job of avoiding that situation, and many consumers will be pleasantly surprised at how well the different systems have been integrated together. The result is a mattress that truly does offer consumers the best of both worlds. When it comes to support, the Alexander hybrid does a great job. This is largely due to the pocketed coil hybrid design which relieves pressure points on the body. Moreover, the excellent support means that it is good for maintaining spine alignment and shape. The Alexander also offers better-than-average airflow, which prevents sleepers from feeling warm or from feeling heat radiate from the mattress while they are sleeping. No more rolling around in search of the cool spot on the bed. A lot of credit for this goes to the pocketed coil design and the copper infused gel that is used in the Alexander’s construction. Perhaps unsurprisingly, the hybrid also has great bounce. This is common to pocketed coil mattresses, but we weren’t sure given the hybrid nature of this particular mattress. The 4” of foam in two layers above the pocketed coil base don’t interfere with the mattress’s bounce at all though. One drawback to this is you do get more motion transfer than you would expect from a mattress made of 100% foam, but not nearly as much as a traditional innerspring mattress. 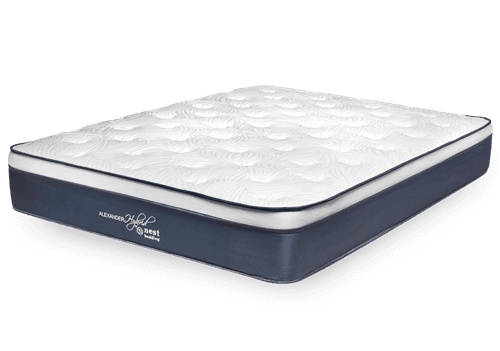 Another advantage that the pocketed coil design offers the Alexander hybrid is greater edge support than mattresses made up of 100% foam. There are several edge support coils along the perimeter of the mattress, and there’s no noticeable difference between weight being put on the edge of the mattress and weight being put further back. This makes it a great option for edge sleepers or for bedtime fun for adults. The overall comfort level of the mattress is good. The levels of support, pressure relief, cooling, bounce, and hug are nicely balanced. This is difficult to pull off, and is a testament to the high quality and solid engineering that go into the Alexander hybrid and its various components. This allows it to bridge the gap between pocketed coil and all foam mattresses. If you’re looking at other reviews of the Alexander hybrid, pay close attention to when they are dated. The company revamped the design in 2016, making it a bit softer and a bit more breathable than the original, although most of the other qualities are about the same. Flat on back – Lying flat on the back with weight evenly distributed produced 1.5” of sinkage. Full on side – Lying on the side with weight evenly distributed resulted in 1.5” of sinking. Full Edge – Similar to the previous test, but with the edge of the bed supporting the full weight of the body. This test resulted in 4” of sinkage. Standing in middle – standing in the middle of the bed with all of the body’s weight on a small area produced 5” of sinkage in our tests. Before you take a look at the pricing, it’s important to note that there are a number of promo codes and other offers out there for discounts on the Alexander Hybrid, so if you’re considering this mattress, make sure to do your research first! Shipping: Alexander offers free shipping within the U.S. Most orders get to their destinations in less than 7 days and the mattress shows up compressed into a box. Warranty: The Alexander hybrid comes with a 20 year warranty, that’s 10 more years than the industry standard, making it an appealing option if you’re the type of consumer who prioritizes warranties. Trial Period: Alexander gives you 101 nights to try their mattress. If you don’t like it you can get a full refund. Those looking for the Goldilocks scenario – not too firm, not too soft. The mattress’s firmness rating of 5.5-6 places it in solidly neutral territory and most sleepers will find it agreeable. Moreover, the fact that you can order the Alexander with different degrees of firmness means that it has a level of customization that isn’t generally offered on the other mattresses in its category and price range. 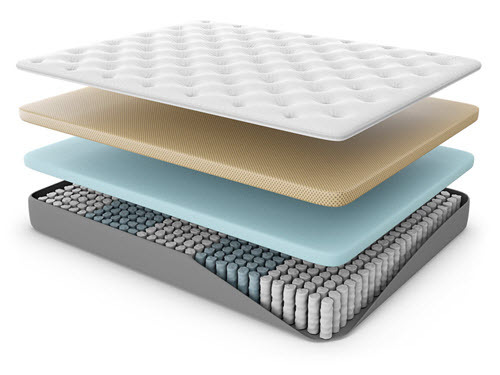 Those who want a pocketed coil/hybrid mattress – the multiple layer construction, 2 layers of foam and the layer of pocketed coils, mean that this is a great compromise for anyone who can’t pick between foam and coils. Additionally, the combination of foam and coils does a great job of providing a high degree of comfort with the bounce and support many look for in a mattress. Those who want a cool bed – the pocketed coil design and copper infused gel to a great job of creating a cool, breathable mattress. If you’ve been unhappy with memory foam mattresses in the past because of the heat they hold, this bed might be the solution you’ve been looking for. On the whole, the Nest Bedding Alexander Hybrid is a quality mattress. It gives consumers the benefits of pocketed coils and memory foam, playing to each material’s strength and minimizing each material’s drawbacks. As a result it’s a good deal when compared to other mattresses that come factory direct at the Alexander’s price point. It’s definitely worth a few nights of trial sleeping at the very least, until you are able to make your final decision.